To teach class members how to judge between good and evil and how to receive a testimony of the gospel and the Book of Mormon. Why Was the 3 Nephites' Wish Helpful for Mormon and Moroni? Encyclopedic entry on the last Nephite prophet, Moroni. Romney, Joseph B. Moroni, Angel In Encyclopedia of Mormonism, Edited by Daniel H. Ludlow. Vol. 2. New York: Macmillan, 1992. Encyclopedic entry on the last Nephite prophet, Moroni, in his role as an angel of the Restoration. Encyclopedic entry on the visits of the angel Moroni to Joseph Smith and others during the Restoration of the gospel. Butler, John M. "The 'Author' and the 'Finisher' of the Book of Mormon." In The Book of Mormon: Fourth Nephi Through Moroni, From Zion to Destruction, edited by Monte S. Nyman and Charles D. Tate, Jr., 61-68. Provo, UT: Religious Studies Center, Brigham Young University, 1995. In the Church we speak of Jesus Christ as the author and finisher of our faith. This paper examines and compares Mormon as an “author” and Joseph Smith as a “finisher” of the Book of Mormon. Perhaps no other prophet personifies the preparation and achievements of Joseph Smith better than the prophet Mormon. He was a type for the Prophet Joseph—foreshadowing Joseph’s life and important mission. A man of God to the end, Mormon the general knows that salvation cannot come by the sword but only through repentance and faith in Christ. 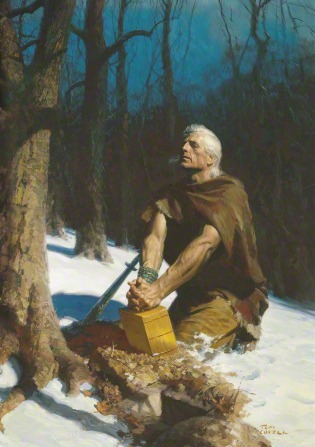 Mormon ends his mortal ministry with his stirring testimony of Jesus and leaves his life’s work, his abridgment of the large plates of Nephi, the Book of Mormon, in the hands of his son, Moroni. Peterson, H. Donl. "Moroni, the Last of the Nephite Prophets." In The Book of Mormon: Fourth Nephi Through Moroni, From Zion to Destruction, edited by Monte S. Nyman and Charles D. Tate, Jr., 235-249. Provo, UT: Religious Studies Center, 1995. Reynolds, Noel B. Book of Mormon Authorship: New Light on Ancient Origins. Provo, UT: Religious Studies Center, 1982. In this volume, nine Latter-day Saint scholars each address the question of Book of Mormon authorship from a different approach. The tests of authenticity they employ rely on analytical techniques borrowed from such diverse disciplines as history, literature, statistics, and ancient Near Eastern studies. Pace, Kevin G., and Mark R. Fotheringham. The Last Nephite, 2015. Pratt, Parley P. An Angel from on High, Edited by John E. Tullidge, 1985. Sheet music on Moroni, the angel of the Restoration. Pratt, Parley P. An Angel from on High (Men's Choir), Edited by John E. Tullidge., 1985. Frederick, Nick. "What Has Moroni to Do with John?" Religious Educator: Perspectives on the Restored Gospel 14, no. 3 (2013): 93-109. Tvedtnes, John A. "Hidden Records." In The Most Correct Book: Insights from a Book of Mormon Scholar, 25-28. Salt Lake City: Cornerstone Publishing, 1999. 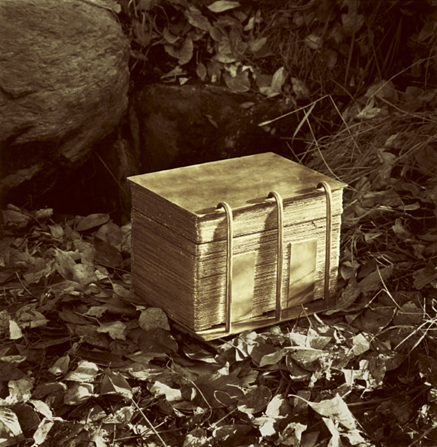 Although perceived as an anomaly and a fabrication by scholars of his day, recent discoveries have vindicated Joseph Smith’s account of a record written on gold plates and buried in the earth in a stone box. Indeed, the practice now appears to have been common among the cultures from which the Book of Mormon peoples derived. Keller, Roger R. "Mormon and Moroni as Authors and Abridgers." In Reexploring the Book of Mormon, edited by John W. Welch, 269-271. Provo, UT: FARMS, 1992. Dahl, Larry E. "Faith, Hope, and Charity." In A Book of Mormon Treasury: Gospel Insights from General Authorities and Religious Educators, 457-470. Provo, UT: Religious Studies Center, 2003. Moroni 7 teaches on principles of faith, hope, and charity. Latter-day Saints enjoy reading these passages, but seldom understand how these principles are expounded throughout the Book of Mormon. Dahl goes through the entire Book of Mormon to bring forth the passages that teach on faith, hope, and charity throughout the Book of Mormon. The end of the book of Moroni, therefore, is not an isolated exposition on these virtues, but rather the culmination of centuries of teaching on these virtues. Welch, John W. "Worthy of Another Look: Reusages of the Words of Christ." Journal of Book of Mormon Studies 22, no. 1 (2013): 62-72. Jesus quoted key phrases, often in inverted order, from the Sermon on the Mount (3 Nephi 12–14) in subsequent Book of Mormon chapters (the book of Moroni), thus demonstrating that the sermon was accepted as an authoritative text establishing and defining Jesus’s kingdom on earth. Sperry, Sidney B. "Literary Problems in the Book of Mormon involving 1 Corinthians 12, 13, and Other New Testament Books." Journal of Book of Mormon Studies 4, no. 1 (1995): 166-174. The literary problem caused by the parallels between Moroni 7-10 and 1 Corinthians 12-13 can be explained if one realizes that Moroni had access to the same teachings of Christ as Paul, and that both received revelation, so that the Lord himself might be the author of both dissertations. Different prophets might have had similar inspiration in dealing with the same topics. Parry, Donald W. "Climactic Forms in the Book of Mormon." In Reexploring the Book of Mormon, edited by John W. Welch, 290-292. Provo, UT: FARMS, 1992. Donald Parry discusses an ancient Hebrew poetic form found in the Book of Mormon called climax. Parry provides several examples of climactic forms found in the Bible, as well as the Book of Mormon, most notably in Moroni 8:25-26. Spencer, Joseph M. "On the Dating of Moroni 8-9." Interpreter: A Journal of Mormon Scripture 22 (2016): 131-148. Moroni 8-9 include two espistles written to Moroni from Mormon, but dating these two epistles have been difficult. This essay argues from textual evidence that the reader should understand the two letters to have been written at rather different times: Moroni 8 in the years 345–50, and Moroni 9 in the years 375–80. Moroni’s inclusion of the letters forces readers to recognize that Mormon’s history is inventive and theologically motivated. Miner, Alan C. "A Chronological Setting for the Epistles of Mormon to Moroni." Journal of Book of Mormon Studies 3, no. 2 (1994): 94-113. Alan Miner also approaches the task of dating Mooni 8-9, but arrives at a different conclusion. 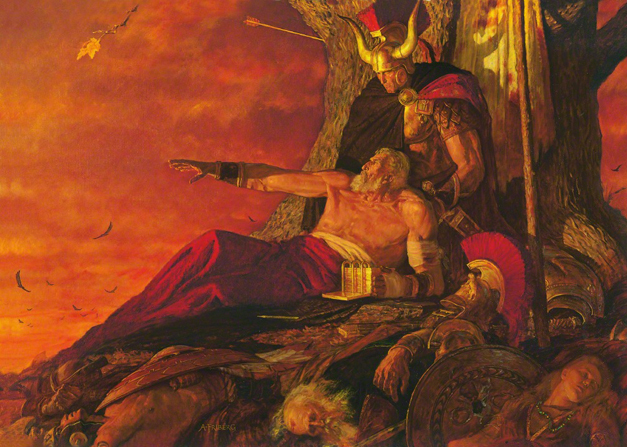 By analyzing the specific chronological clues contained within Mormon’s epistles, and comparing them with his abridged record of the final years of the Nephite nation, we can create a set of chronological time frames which then can be compared to construct a reasonable historical setting of A.D. 375 to 376. Roper, Matthew. "The Baptism of Little Children in Pre-Columbian Mesoamerica." Insights 23, no. 3 (2005). In a letter to his son Moroni, Mormon warns against the practice of baptizing infants. It was apparently a common enough practice among the Nephites and Lamanites that it warranted censure. There are various accounts of pre-Columbian American cultures performing water-cleansing rituals on infants to purify them of the evils of their parents. In the final chapters of the Book of Mormon before he sealed up the plates from which it was translated, Moroni invited "all the ends of the earth... [to] come unto Christ, and be perfected in him"(Moroni 10:24, 32). However, Moroni 9-10 is more than just an invitation. Through a series of exhortations Moroni teaches us how to come unto Christ, and he also gives insight into the power of God that perfects and sanctifies those who do come unto him. These scholars explain various Book of Mormon names and how they have been found in inscriptions in archaeological excavations in the ancient world. Luram is the name of a Nephite military leader who served with Mormon (see Moroni 9:2). The name is reflected in the second element of the name ‘dn-Lrm, “Lord of LRM,” known from a seal of ca. 720 BC found during excavations at Hama (Hamath) in Syria. The name is also known from graffiti on three bricks from the same level at Hama. Bokovoy, David E., and John A. Tvedtnes. "Hebrew Reflected in the Book of Mormon." In Testaments: Links between the Book of Mormon and the Hebrew Bible, 202-229. Toelle, UT: Heritage Press, 2003. Moroni 9:33 expresses that Nephite authors would have written in Hebrew if their plates were large enough. In light of this statement, Bokovoy points out different ways throughout the Book of Mormon that Hebrew language and style is reflected in the text. In Moroni 10, Moroni exhorts readers to remember how merciful God has been, from Adam until now. While this may simply be interpreted as God being forever merciful, LeGrand and Ricks propose that Moroni's reference to Adam may invoke certain temple themes. Moroni seeks to draw the reader's mind to the ancient Israelite temple drama theme that has permeated his father’s writings. Moroni 10:4-5 is often presented as a singular promise for engaging with the text,knowing the Book of Mormon is true, and thus becoming converted to the LDS Church. This article argues that verses 3 and 4 are distinct methods for engaging scripture, each verse with a unique promise. Further, verse 4 represents an initial, independent, and fundamental step for gaining a scriptural testimony, as well as for canonizing a text. Cook, Gene R. "Moroni's Promise." Ensign. April 1994. This Ensign article discusses how Moroni 10:3–5 takes on far greater depth when readers follow its admonitions to study, ponder, and exercise faith. In addition to the great promise in these verses which helps those who are investigating the gospel to gain a testimony of the Book of Mormon, the process Moroni teaches here can be used in confirming all truth. This is a process we can go through every time we wish to have eternal truth confirmed. Anderson, M. Steven. "My Great-Grandmother and the Book of Mormon." Religious Educator: Perspectives on the Restored Gospel 7, no. 2 (2006): 87-90. This is a touching personal essay explaining Anderson's memory of his great-grandmother and her miraculous conversion to the gospel. Her conversion came as she read the Book of Mormon and, without realizing it, fulfilled Moroni's promise in Moroni 10. Spackman, Ben. "Negative Questions in the Book of Mormon." Insights 26, no. 4 (2006). Ben Spackman demonstrates that part of Moroni's promise in Moroni 10:4-5 employs an ancient Hebrew literary device. The question Moroni poses in Moroni 10:4 is a negative rhetorical question, used to give emphasis. This use of negative rhetorical questions are employed throughout the Old Testament, as this article shows. Preece, Michael J. Learning to Love the Book of Mormon - The Book of Moroni., 2014. Smith, Joseph F. "Questions and Answers - The Angel Who Restored the Gospel." Improvement Era 6, no. 5 (1903): 393-394.